The Muskoka Region and Simcoe County are two of the best regions for real estate beauty. They represent the two best regions that Central Ontario has to offer. Simcoe Muskoka encompasses the Muskoka District, or simply Muskoka. Muskoka, for one, is known for its stunning scenery and its 1,600 beautiful lakes, making it a popular destination of Hollywood's brightest celebrities. Celebrity stars such as Tom Hanks, Steven Spielberg, Nancy Dolman, Martin Short, Mike Weir, Kurt Russell and Goldie Hawn among others who have built retreats and resorts in this beautiful part of Canada. 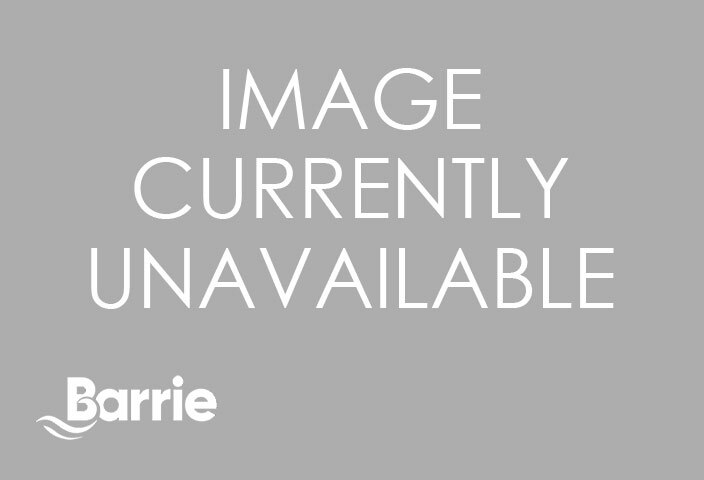 Muskoka is otherwise known as Muskoka District Municipality or the District of Muskoka. This lush region stretches to 2,500 square miles--the Algonquin Provincial Park to the east, Georgian Bay to the West, and Lake Couchiching to the south. Along with Haliburton, it is referred to as "cottage country" because of its scenic views. Its villages, farming communities, lakes, resorts, and hotels that are near wooden boats, country clubs, golf courses, and marinas make it deserve its name. The Muskoka District consists of townships from the Lake of Bays to Bracebridge. Six municipalities comprise this quiet but exquisite region in Ontario's lush center. These are Bracebridge, Gravenhurst, Huntsville, Lake of Bays, Georgina Bay, and Muskoka Lakes. The place is ideal in the summer for sports like sailing, windsurfing, canoeing, kayaking, waterskiing, and numerous water activities. It is not surprising, that summer camps have mushroomed in this part of Canada, making a great getaway for the traveler. Its peaceful and natural surroundings make it perfect for the break you may have been waiting for. When you think of the stars that have chose to build retreats and cottage houses here, the idea of living like a star might just cross your mind. Aside from its serene lakes, Muskoka also has low hills that are covered with woods, which also makes it best for hiking and nature trekking. There are tours around the roads in Lake of Bays because of its scenic views. Highways 60, 117, 35, 2 are known for having nice views. If you come along the area, don't forget to visit the town of Dorset and its Fire Tower. It is sure to be one of those unforgettable sights in the central region of Ontario. As already said, this region is particularly great in the summer. No wonder it has 50,000 residents and an abundant outpouring of 100,000 seasonal property owners, plus the yearly flock of visitors. A large number of the seasonal properties are enormous mansion like estates, many have been passed on from generation to generation. Recently, several Hollywood and sports stars have built their getaways in Muskoka, including Tom Hanks, Steven Spielberg and Mike Weir, as well as Goldie Hawn and Kurt Russell. Also, Eddie Van Halen, Martin Short and Catherine O'Hara are rumoured to have summer estates here. The Muskoka Airport is located just off Highway 11 right on the border of the Muskoka cities of Bracebridge and Gravenhurst, it is not unusual to see rich and famous celebrities flying in to the discreet airport via a private jet charter. Known as the summer colony of Central Ontario, Muskoka is dotted by many summer estates, most of which have become a family heritage from generation to generation. Though there are less expensive properties in Muskoka, lakefront cottages that stand near the Lakes of Rousseau, Joseph, and Muskoka are said to be the most expensive properties in the area. This attests to the region's already stable real estate core, making it one of the most secure places in the American continent to invest in property. What�s more is that with only a two-hour drive from Toronto, you could already come and see just how awe-inspiring and tranquil the views are here. Just thinking of Muskoka is a favourite mental break. Wouldn't you like to make these fabulous views longer lasting through an actual window of your own in this region? Why not try renting a cottage in this world renown area, browse through some of the cottages for rent. When you think of Muskoka most people speak of the big three lakes and the cottage where Goldie Hawn lives. However, in Muskoka the vast amount of wildlife and the terrain is astounding. The terrain is comprised of Precambrian rock, pink granite and giant pines. It is as unique as it is beautiful. Muskoka is often thought of one of the worlds most natural attractive spots ranking up there with the likes of the Galapagos Islands or the Grand Canyon. Simcoe Muskoka is made up of Simcoe County a county also located in the heart of Ontario, which according to latest reviews is one of the fastest growing regions in Ontario. With a population that grew 14.2 percent from 2001 to 2006, it ranked after the Peel, York and London regions of Ontario as one of the fastest-growing regions. The county extends 4,840.54 square kilometers between Georgian Bay and Lake Simcoe. Its capital city, Barrie, is the largest city in the county, which is known for being home to the MacLaren Art Center, an art gallery displaying the best of Simcoe visual artists. Barrie is the 35th largest municipality in Canada on Kempenfelt Bay along an arm of Lake Simcoe in the Central region of Ontario, Canada. 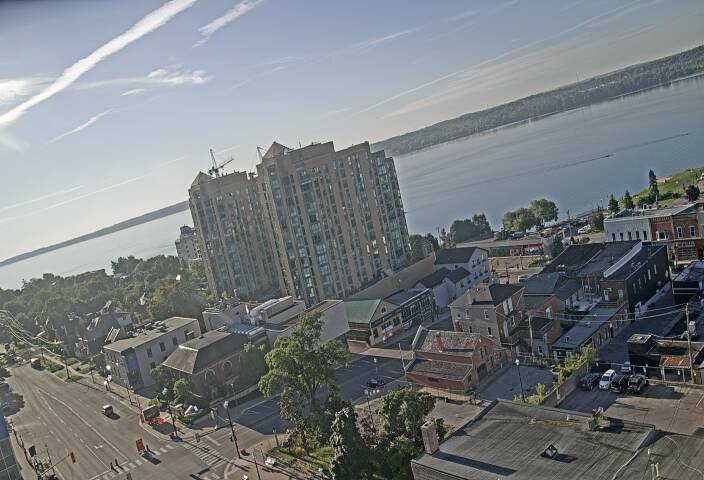 From its north and south ends, the city is separated by the deep underwater valley of Kempenfelt Bay. Most accessible to highways 90, 400, 27 and 11, Barrie is a 50-minute drive to the Pearson International Airport through the six-lane Highway 400 that runs through the city. Highway 400 on of the busiest highways in Canada and offers a quick efficient route between Toronto and Barrie, however, it is prone to traffic incidents, before driving on Highway 400 always check the traffic, for your convenience you can see complete Highway 400 Webcam Traffic Reports here, even when traffic is light it pays to check our traffic cameras to avoid those construction delays. The extensive network of highways also makes Simcoe an accessible destination to real estate hunters and developers, making the region ever growing these past years. 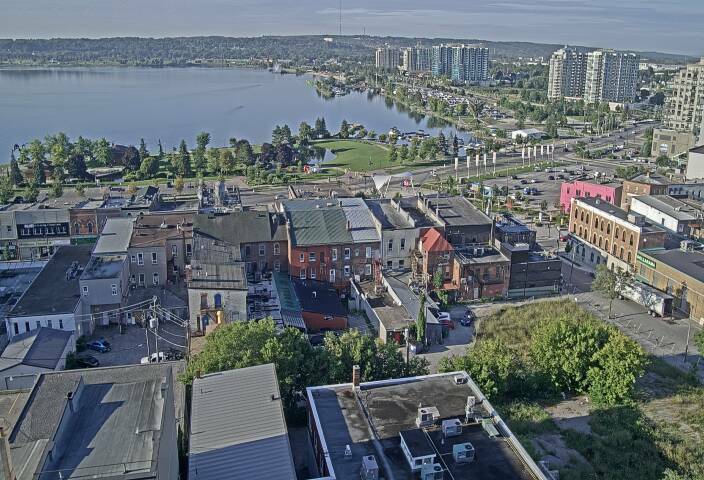 Embraced by the western ridge of the Kempenfelt Bay, Barrie's old town lies flat near the city's center, which through the years, has expanded beyond the low-lying plain of this valley into higher ground surrounding the area. As one moves farther from this area in Lake Simcoe, one is met with rugged terrains rife with rolling hills. Many streams and creeks cut through the city that has no major rivers within its area. The view of Lake Simcoe is almost spell-binding, with its well-preserved wooded areas and mountain views. Barrie's climate is nothing but awesome. It has hot summers and snowy winters, both perfect for sports activities. Located in what is called Ontario's Snowbelt region, Barrie is blessed with its numerous winter recreational activities and facilities. From skiing, snowboarding, ice fishing to snowmobile trails, Barrie offers the best of winter sports in the county. Lined with the splendid beaches of Minet's Point, Johnsons, The Gables, Tyndale, and Centennial, Kempenfelt Bay is also pleasant for boating and other water sports. If there is a better way to make your life an everyday vacation, Barrie is the place. Considered the gateway to Ontario resort destinations, Barrie is indeed situated in an area people might have missed. Too bad, Simcoe just has a lot of beautiful real estate to offer. Whether it's a summer house or a house for the winter, Simcoe County has the amenities to make your vacation or residency pleasurable in one of the safest towns in Ontario, Barrie. It's practically difficult to choose between Simcoe County and the Muskoka Region. Both places offer possibilities, which may just be waiting to be tapped into. Nevertheless, this just goes to show how in this central part of Ontario, a secret undisturbed place may just be waiting for you. For those who have already discovered the beauty of Simcoe County, Barrie even has a few luxury resorts of its own. Resort timeshare ownership is an enticing option for many visitors since you can vacation here annually without having to make reservations. Settling on a resort destination, however, can be challenging, because there are so many wonderful options. The soap opera Paradise Falls, about a fictitious cottage community, was taped partly on location here, to take advantage of the scenic background. SimcoeMuskoka region made up of the Muskoka region and Simcoe County boasts many wonderful area attractions which can be found by clicking here. Remember before driving into this region to check the traffic, for your convenience you can see complete Webcam Traffic Reports here.